We’ve had the pleasure to talk to Rebecka Karlsson. Just 18 years old, Idol [Swedish Idol] alumn and ready to take on her first Melodifestivalen adventure! 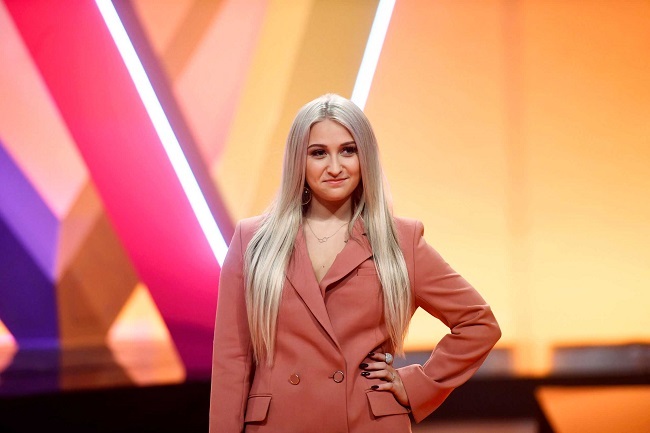 You’ll get to know how she found out she’d be competing in Melodifestivalen, her plans for the future and what there’ll be no shortage of in her performance this Saturday! Hej Rebecka! Congratulations on being chosen to compete in Melodifestivalen! What made you decide to compete and how did you find out you were one of the chosen twenty-eight? Hello and thank u so much! I have always wanted to be in Melodifestivalen. It has been a dream since I was 4 years old. My record label (Warner) suprised me in september 2018. I flew up to Stockholm for a meeting and then suddenly Christer Björkman came in and congratulated me! I was so suprised and happy! Rebecka singing ‘All By Myself’ during the final of Idol Sverige, receiving great praise from the jury members! You have been in competitions before, like Talang and Idol [basically Sweden’s Got Talent and Pop Idol]. Do you think that gave you skills and maybe some kind of confidence to take on this adventure? Yes that is true. I do believe that it has given me so much confidence. That’s when I really started believing in myself and trusting my vocals. Could you tell us what the message of your song ‘Who I Am’ is, what is it about? My song ‘Who I Am’ is all about believing in your dreams and in yourself. You should never stop fighting for yourself even if people try to bring you down! This song is based on me and my life! So it is as real as it can be! Is there anything you can reveal about your staging yet? If you would win Melodifestivalen, how would you react, you think? And what would it mean to you to represent Sweden in the Eurovision Song Contest? If I were to win Melodifestivalen and represent Sweden in the Eurovision Song Contest I would feel so proud of myself and my song! That would have meant that my song touched other people’s hearts and that I now got the chance to do it again. I get to inspire more people and that would mean the world to me. I would cry out of joy and happiness! Do you have any plans regarding what you’re gonna do after Melodifestivalen to share with us? After melodifestivalen I am going to graduate from my school and then keep on singing and writing new songs! Hopefully release some new singles! Thanks so much for doing this interview with us, Rebecka, and we wish you all the best in Melodifestivalen! Split of songs per semi finals in Beovizija 2019 announced!